are known as the duck-billed dinosaurs of the Cretaceous. The lived from 75 to 65 million years ago. Many species have chambered or solid crests on their skull which they may have used to blast auditory signals. Hadrosaurs were fast running herbivores that dwelled on land and had evolved a unique way of chewing their food. Hadrosaur anatomy has been frequently well-preserved. Hadrosaurs are found in North America, Europe, and Asia. They are ornithchians (meaning bird-hipped), and have iguanodont ancestors that emerged in the Middle Jurassic. Hadrosaurids are further classified into two sub-families, the lambeosaurines and the saurolophines. The family Hadrosauridae is divided into two categories: those with hollow cranial crests, and those without. The flattened and beak-tipped snout was well suited for nipping off vegetation. Hadrosaurs had hundreds of teeth arranged into batteries. Fossilized nests and hatchlings imply that Hadrosaurs attended their young. Hadrosaurs are ornithchians which were quite small at their emergence, but in the Cretaceous they evolved to be very large. They were more abundant than sauropods. 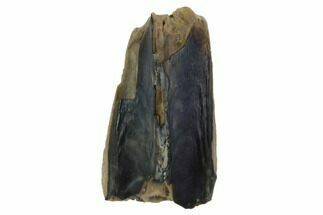 In 1855-1856, fossilized hadrosaur teeth were discovered. 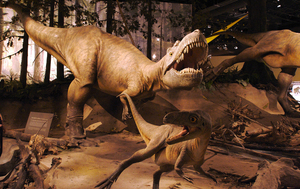 They led to the identification and naming of the first family of dinosaurs in North America. The once accepted and well-known genus Trachodon is now obsolete. Lambeosaurinae had hollow cranial crests, and some species appear to have had tubes within the cranial feature. Nasal passages formed chambers and loops that may have resonated unique and loud sounds. The most plausible uses for such a chamber include: projecting a warning signal to announce predators, and an auditory signal for social behavior such as mating or keeping the herd intact. The crests may have had a visual purpose to attract mates and identify individuals. Saurolophinae. These hadrosaurs did not have the hollow cranial crests, and they were generally more thick and heavy. Some members are found on two continents. hadrosaurs weighed about 3 tons and were nearly 30 feet long. Complete skeletons of the Albertan species of Saurolophus place its length at 32 feet and its weight at 2.1 tons. The Mongolian species type specimen is 39.4 feet long. Shantungosaurus lived in eastern Asian woodlands. It is estimated to have been 50 feet long and would have weighed about 15 tons. Shatungosaurus would have been one of the largest ornithiscians. Lambeosaurines are divided into smaller clades. These are: Aralosaurins, Lambeosaurins, Parasaurolophins and Tsintaosaurins . Species of the Lambeosaurines had a variance of hollow crest shapes. The hollow chambers of Lambeosaurine crests are surmised to have projected a particular sound that may have been unique to different species. Saurolophinea is a family that is divided into smaller clades. These are Saurolophins, Brachylophosaurins and Kritosaurins. Sub-family Saurolophininae is also known as Hadrosaurinae. Their crests were solid to non-existent. The genus Saurolophus lived 69.5- 68.5 mya. It had a spiky crest that pointed up and back from the cranium at a 45 degree angle. The crest was not entirely solid, as it did have some chamber space in the spike. 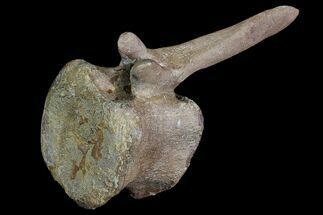 Since the crest is significantly solid, and the pelvis is like that of other saurolophines, it remains in the saurolophine clade. Edmontosaurus is often referred to. It is a Late Cretaceous hadrosaur and it does not have a crest. A system of describing hadrosaurs according to tribes has been a more recent development as relationships between species become more evident. These tribes are not scientifically defined or used conventionally in literature. However, it is notable that the names and classification of hadrosaurs have been under considerable examination. Hadrosaurs get their duck-billed nickname from the broad and flat beak which grew from the front of the skull. This trait was ideal for snapping off leaves and twigs. The back of the mouth had hundreds to thousands of teeth. The teeth were suited for efficiently grinding the vegetation before it was swallowed. 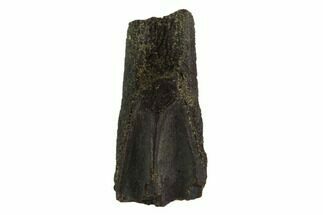 A hypothesis attributes the numerous teeth as a reason for hadrosaur success in the Cretaceous. This hypothesis is based on sauropods being dependant on gastroliths to grind their food; however there is some question as to whether gastroliths were utilized by sauropods. 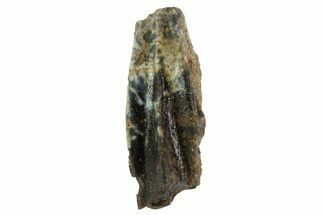 In 2009, Mark Purnell and his team studied the micro-scratches of Edmontosaurus teeth. They revealed that hadrosaurs utilized a special hinge in the upper jaws to assist chewing. 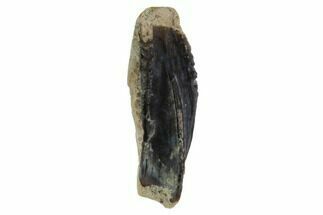 This allowed the upper jaws to press outward and to the side as the lower jaw ground food against the upper teeth. Living mammals utilize a lower jaw joint which is more flexible. Hadrosaurs had cheeks. With their unique jaw and hundreds of teeth, they would have been master chewers. Shantungosaurus had thousands of teeth. 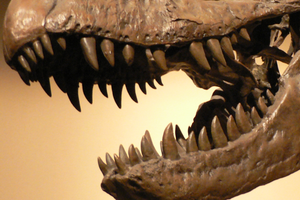 Other dinosaurs did not have cheeks, so they had the lizard-like smile. Hadrosaurs did not have visible fingers. Like sauropods, the fingers would have appeared undivided and fused into a pad of flesh. Other descriptions from tracks assert that pads of the feet were webbed and soft like a camel foot. The pad is believed to be nail-less. Hadrosaur tails were tough and rigid. The stiffness is surmised from ossified tendons. Edmontosaurus has tendons which are described as cross-bracing, and able to support the tail in a manner that prevented it from bending. For this reason, the stiff tail is not believed to have been used for swimming. Scleral rings, believed to have supported the eye, were analyzed for hadrosaurs. These features are rings of bone in the eyes which are not present in mammals or crocodiles. 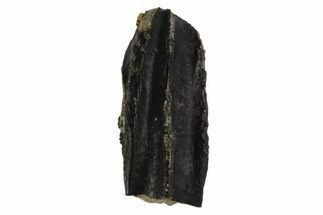 They were utilized by other such animals as ichthyosaurs and pterosaurs. When compared with sclera rings from birds and lizards, hadrosaurs appear to have been active in short intervals throughout the day. hadrosaur diet has been the subject of several studies. In 2008, graduate student J.S. Tweet and his team concluded that Brachylophosaurus probably browsed vegetation. 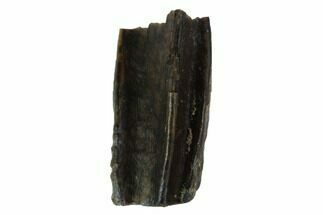 The team reported that tiny leaf fragments were found in the gut region of the well preserved specimen. 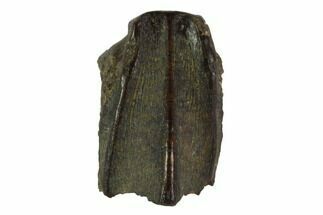 Purnell, Williams, and Barrett concluded from their studies on hadrosaur teeth, that the animal was like a grazer. This was surmised from the evenness of the scratches on the teeth which suggest a repetitive jaw motion. The wear patterns studied by Purnell et al. were not consistent with those expected for a browsing animal chewing on twigs or stems. Therefore the hadrosaurs’ diet would have been horsetails and other plants growing low to the ground. The evidence is not considered as conclusive as that about the jaw motions. However, the Tweet analysis may not tell the whole story, either. Purnell points out that the fossilized remains in a stomach may not be representative of a typical diet. Another clue to hadrosaur diet may be in the height and extension of the animal. In 2013, Mallon et al. studied different herbivores of the Late Cretaceous. The study focused on species living on the continent, Larimidia. 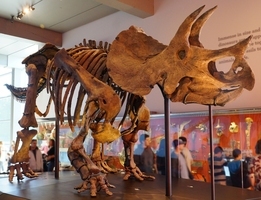 Small herbivores, ceratopsids, and ankylosaurs would have been restricted to meals within reach, while the hadrosaurs were able to reach the low growing vegetation that was too high for ceratopsids. As a quadruped, hadrosaurs would have been able to graze within 2 m of the ground, As a biped, that figure could be as much as 5 meters. Ornithopods could hold food in their cheeks as they chewed the rest of the bite. This was an advantage that reduced digestion time. Sauropods did not have cheeks. By comparison, sauropods would have had to swallow their food in larger chunks. Their hulking sauropod gut would digest the food across several days. Hadrosaurs were rather bulky themselves, but not generally as big as the sauropod giants. 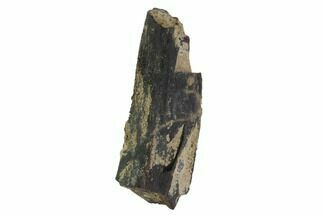 Coprolites reveal that some hadrosaurs had eaten decomposing wood. The wood was certainly substrate for bacteria and fungi. It would also been a source of nutritious invertebrates. Dinosaur Park Formation has been key to understanding the nesting habitat of hadrosaurs. The presence of invertebrate shells apparently acted as buffer in the acid water of the lowlands. Tiny hadrosaur shell fragments were preserved in the microenvironments. The lack of abrasion on the fragments suggests that the shells did not travel far before they were buried. The belief that hadrosaurs only nested on the uplands may have been caused by the preferential collection of larger specimens. Small fragments of shells and pieces of juvenile hadrosaur appear to have been overlooked for some time. Many bones and dentaries have been recovered from the lowlands. Significantly, the lack of abrasion on the fossils suggests that the fossils were covered and preserved near their original resting place. 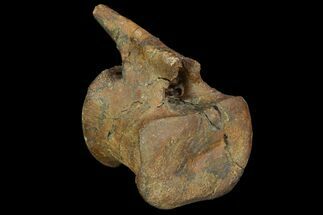 The higher pH from the calcium carbonate shells of clams and snails prevented the complete breakdown of the hadrosaur eggshells, which are described as pebbly in texture. The discovery of well-preserved, and communal nests have led scientists to suppose that hadrosaurs may have migrated to nesting grounds to reproduce. This behavior would have been like that seen in many species of birds. The hadrosaur, Maiasaura, means “good mother lizard.” Fifteen juveniles were collected in 1978 from the Two Medicine Fm. of western Montana. These little dinos were found with eggshells, were all the same species and age, and are considered nestlings. The adults would have been too big to sit on the nest. It is supposed that eggs were kept warm by covering them with vegetation. This technique is also seen with crocodiles. They take advantage of the heat produced by fermenting plants. After hatching, parents would have delivered fruit and bits of vegetation to nest. The hatchling was 14 inches and 1.5 lbs. Hadrosaur fossils of neonates have been described, though the likelihood of preservation is much less than for more mature specimens. 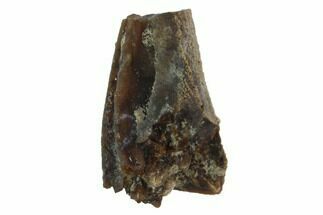 Small bones were likely to have been meals for scavengers or to have simply eroded out of existence. In areas where juvenile bones are found, there has been a lack of eggshell material. Due to new discoveries, the acidic nature of water flowing through bone beds, and collection bias, the scant remains of tiny hadrosaurs no longer constrain their habitat. Hadrosaurs are now considered to have occupied niches in both lowlands and uplands, though breeding locale is still inconclusive. Different species may have preferred slightly different habitat. Hadrosaurs appear to mature as a small version of the adults. Juveniles have the same anatomy as the adults, just proportionately smaller. The Blackhawk Formation of Utah is where very small hadrosaur footprints have been preserved. The Cretaceous was a period of very warm climates of the Earth. It began 142 million years ago, and continued until the famous, Cretaceous-Tertiary Mass Extinction that occurred 65 mya. There were no ice caps and the ocean was at its highest level. Much of the middle of the United States was underwater. North and South America continued to drift away from Europe and Africa. The land masses were recognizable, but still relatively close to each other. As a result of tectonics, the Atlantic Ocean continued to expand. 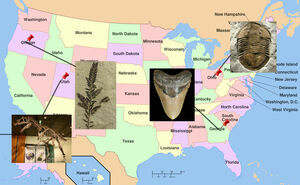 The Cretaceous is named for the white, chalky limestones of northern France and south-eastern England. The Western Interior Seaway is significant to deposits of the Horseshoe Canyon Formation. In the Cretaceous, this shallow sea left marine deposits across the middle of North America. Some species of hadrosaurs are also found in China and Mongolia. The Nemegt Fm. in the Gobi desert, during the Cretaceous, was a wet environment full of streams, rivers and wet lowlands that offered a diverse habitat. There was a variety of flora on the Earth at the time. Plants included: oaks and beeches, ancient conifers, modern confers that produced pollen and seeds, lilies, members of the rose family, as well as ginkgos, cycads, and horsetails. Fauna of the Late Cretaceous included many famous animals. These included: Plesiosaurs, Pterosaurs, Tyrannosaurus, giant sauropods, the turkey-sized Velociraptor, ceratopsids, crocodiles, and many other animals. Some other notable creatures are amphibians, bees, ants, cockroaches, scorpions, jellyfish, ammonites, dragonflies, barnacles, boas, ray-finned fish, stingrays, and the synapsids from which arose the mammals. Birds had continued their evolution. By the Late Cretaceous they had become more recognizable when compared to modern birds. The Late Cretaceous is when the duck-billed dinosaurs thrived. They were ornithopods, as were iguanodonts. Ornithopods possessed the advantage of having cheeks and the ability to digest food more quickly. They were more abundant than sauropods, though they met extinction with the rest of the dinosaurs. Flood basalt volcanoes, explosive volcanic eruptions, and the impact of an asteroid or comet are all reasons attributed to the mass extinction at the Cretaceous-Tertiary boundary. 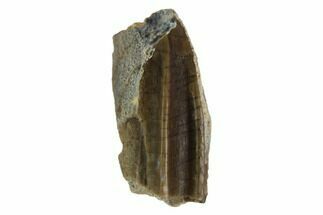 The stratigraphic record shows clear changes in the sedimentary deposits from all over the world. Horse Canyon Formation in Alberta, photo by "Anky-man"
is a genus from the lower Edmonton Formation in Alberta, Canada. The Edmonton Fm. is now called the Horseshoe Canyon Formation. A famous specimen, Edmontosaurus annectens, was unearthed by the Sternbergs in Converse Co., Wyoming. This specimen left behind a remarkable impression of its skin. Specimens of this genus have been the subject of reclassification as more complete specimens are found. Several genera of hadrosaurs have been found with skin impressions. The Hell Creek Formation in North Dakota yielded one of the more spectacular finds of the 20th century. In 1999, a mummified hadrosaur was found with ligaments, tendons, complete skin, and maybe internal organs. The calculation of its muscle mass revealed that it was likely able to outrun carnivores such as T-rex. Boeing Co. has participated in the study of this specimen by allowing it to be imaged with their CT scanner, the largest in the world of its kind. This specimen has also revealed that hadrosaurs were probably longer and more flexible than envisioned. A space of about a centimeter was between individual vertebra, allowing room for a disc or another kind of tissue.